I never get tired of painting apples. Today's apples were painted with my new Rosemary & Co. brushes. I bought them because simply everyone was talking about them, and I had to see what all the fuss was about. I bought the Ivory short flats, and they are very comparable to my Silver Bristlon brights. A couple of things you should know before you order: 1. be prepared to pay in pounds, as they are located in London (shipping is reasonable), 2. if you don't opt for the longer brushes (a teensy bit more expensive) they are going to be about 8 inches long. I have a friend who uses both and swears the Rosemary brushes keep their sharp edge longer. I've been using them for about a month and so far can't see a difference, but I may amend that later. For now, I'd say they are comparable. And we never get bored seeing your apple paintings.!!! Thank you for the tip about brushes, may be some day you can give another art byte comparing different brushe, and what affect/ effects do they really have, and the importnce in investing on good brushes. I love Rosemary brushes, the long mongoose with the long handle flat especially. Love the painting too! There is a currency converter that converts all the displayed prices to US dollars. But if you have a problem with the brushes you have to pay for the return shipping costs which are higher for the individual. I had problems with their 'sable' brushes, they denied it, and I will not do business with them again. What a rich color scheme! I want to keep on lookin'! Thanks for the Rosemary review - please post again with your final verdict! i tried to comment yesterday..love these brushes and found a stateside outlet for them. he has permission to sell for rosemary over here..legacy art products! I am not an artist or an art major, but I like your painting especially with these apples and the vase painting. A lot of your paintings have a symmetric shape which I think it is very interesting to see different look of people, flower, fruits etc than the reality. 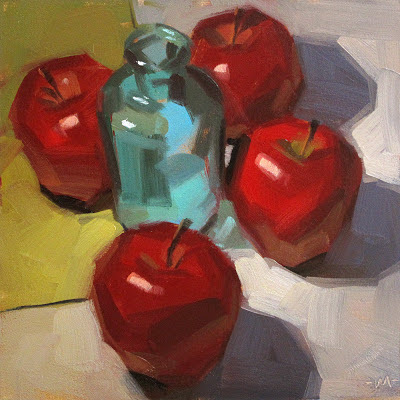 The apples in this painting have a sharp edge and look kind of square around them. The light must be on the left side of the objects because the shadow is on the right side of the apples. Each of the apples has a shinny effect on them which result from the lighting effect. I also like the contrast color between the red apple and the green-blue vase in the middle. I am not sure what is the green-yellow on the left corner that lie under the one of the apple is all about.